The researchers found that a class of molecules called sulfidic anions may have been abundant in Earth's lakes and rivers. 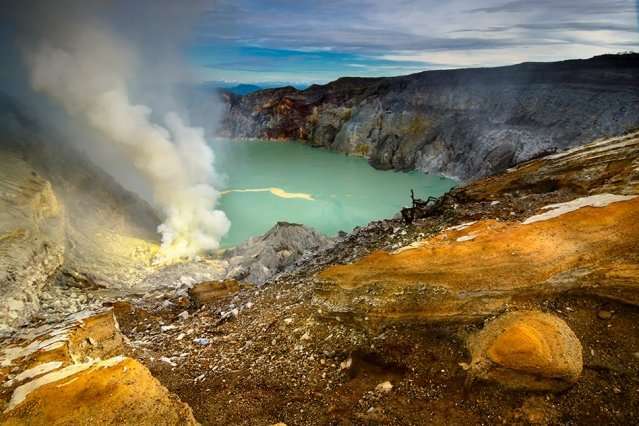 They calculate that, around 3.9 billion years ago, erupting volcanoes emitted huge quantities of sulfur dioxide into the atmosphere, which eventually settled and dissolved in water as sulfidic anions—specifically, sulfites and bisulfites. These molecules likely had a chance to accumulate in shallow waters such as lakes and rivers. In 2015, chemists from Cambridge University, led by John Sutherland, who is a co-author on the current study, discovered a way to synthesize the precursors to RNA using just hydrogen cyanide, hydrogen sulfide, and ultraviolet light—all ingredients that are thought to have been available on early Earth, before the appearance of the first life forms. Next, he wrote a simple aqueous geochemistry model to calculate how much of these gases would have been dissolved in shallow lakes and reservoirs—environments that would have been more conducive to concentrating life-forming reactions, versus vast oceans, where molecules could easily dissipate. Interestingly, he consulted the literature in a rather unexpected subject while conducting these calculations: winemaking—a science that involves, in part, dissolving sulfur dioxide in water to produce sulfites and bisulfites under oxygenless conditions similar to those on early Earth. The new results point to sulfites and bisulfites as a new class of molecules—ones that were actually available on early Earth—that chemists can now test in the lab, to see whether they can synthesize from these molecules the precursors for life.